Investor:Centre de Negocis i de Convencions S.A. The mountain with the historical cathedral Seu Vella and the Segre river mark the high and low points of the mountainous landscape in which Lleida lies, after Barcelona the second city of Catalonia. On the banks of the Segre, somewhat outside the centre of the city, is coming La Llotja, a large conference centre with a theatre. Mecanoo has interpreted the landscape of Lleida as an exciting decor before which the building has been set down somewhat away from the river. The mise-en-scène is elaborated on three levels of scale. Regarded at the large scale of the region, the building represents a connecting link between the river and the mountain. Viewed at the level of the city, La Llotja and the river forms a balanced composition. 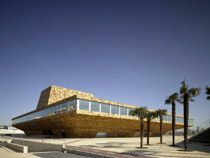 At street level the cantilevers of the La Llotja de Lleida conference centre provide protection from sun and rain. The large stone edifice seems to have sprouted from the Spanish earth. The building’s horizontal form provides a large garden on the roof, while under the cantilevers begins a square for events, with the stairs of the adjacent building serving as a tribune. Parking is underground, the loading area for trucks is at ground floor, where you also find the floor of the theatre stage, the dressing rooms and the restaurant kitchen. The loading area for small trucks is at -1. In a light court in the centre of the building, a monumental staircase rises from street level to the multi-functional hall on the first floor. A ramp leads on to the foyer on the second level where there is a panoramic window looking out across the city and the river. In the foyer are the entrances to the theatre, which also serves as a large conference hall, meeting rooms and a small conference room. The latter is visually connected to the multifunctional hall by means of a raked tribune separated by a glass wall. The press office, VIP rooms and a meeting centre are situated on the city side of the building, accessed by an internal corridor. The entire functional logistics for the theatre and the conference centre are situated inconspicuously but extremely functionally. Restaurants with bars are located on the side of La Llotja facing the river and the square. The monolithic building is in fact composed of different pieces of buildings linked together by sound-absorbing foyers. Materials ensure distinction and orientation in the interior. The exterior is of stone. Inside there are mainly white, plastered walls and either wooden or marble floors. The entrance hall and the multi-functional hall have a marble floor, while the foyer has a floor of mixed hardwood. The theatre has the atmosphere of an orchard with walls of dark wood in which trees of light have been cut out. The colour palette of fruit is a theme that recurs in small details throughout the building. After all, the region of Lleida is famous for its fruit production. The roof is colourful: pergolas support a range of creepers and climbers like roses, jasmin and ivy. The garden with its mirador is not only pleasant but also useful since the ground cover keeps the roof cool in the summer, provides a beautiful view for people living in the neighbourhood and serves an extra place for conference guests to sojourn.